Granted, it's a bummer that there's no new episode of The Office tonight, but what's airing in its stead has just as much potential for cringe-inducing, awkward hilarity. That's right, the Vice Presidential debate airs tonight, pitting Sarah "I read ALL the newspapers" Palin against Joe "Gaffe-o-matic" Biden. 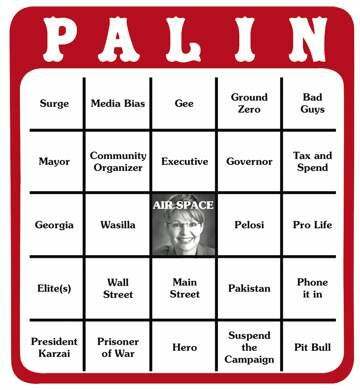 In case you're still recovering from last Friday's Presidential Debate drinking game—drinking whenever someone says the words "change" or "my friends" results in blackout after 20 minutes—here's a more wholesome play-along option: Palin Bingo. There are four card options you can print out and play, including the one above. Winner gets a Sarah Cuda.